which would all benefit from being stuffed! Stuffing can be anything you have to hand – that’s edible, of course! This recipe started out as a chestnut stuffing one and quickly became an apple and dates stuffing, instead. Put all the ingredients except the egg into a basin and mix together. Make a well in to the centre of the ingredients and add the beaten egg. Now, mix into the other ingredients. Don’t make the stuffing too wet or too dry; if too wet it will be stodgy and if too dry it will be crumbly and difficult to handle. You are now ready to stuff the turkey. It’s easiest to stuff by turning the turkey to lie on it’s front, so enabling you easy access to the neck area. 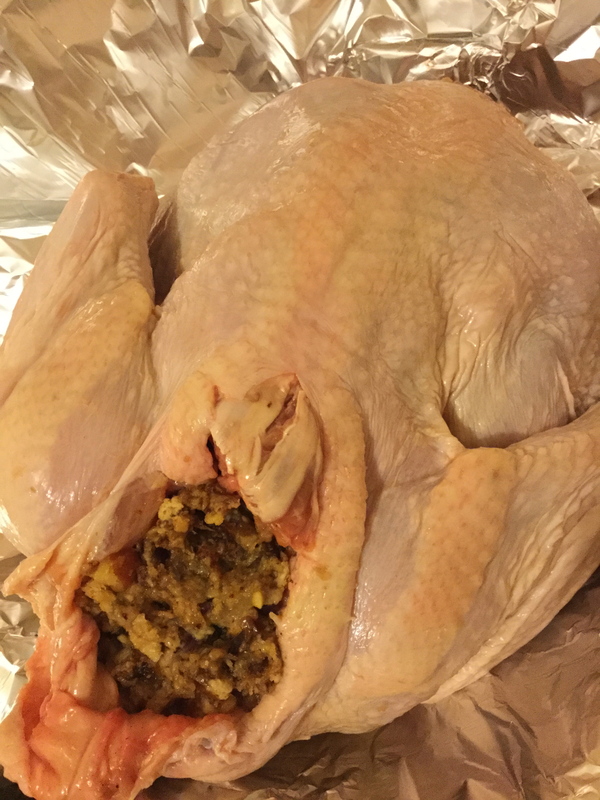 Put the stuffing in the neck end ONLY as it might not cook sufficiently in the body cavity. Dawn: Don’t add the egg until you are ready to stuff the turkey. This prevents bacteria penetrating the stuffing which may not reach a sufficiently high temperature during the cooking to kill it off so DON’T add the egg until you are ready to cook the turkey. Andrew: A chicken or turkey will benefit from being stuffed as the stuffing will help keep the meat moist as it cooks. It simply helps prevent the meat from drying out too much during the long cooking time. Dawn: Absolutely, and some recipes will use sausage meat in the stuffing. Andrew: Yes, this is true. The egg will offer sufficient moisture for a turkey up to to about 6-7kg in weight. Dawn: Additional moisture can come from smearing the turkey with butter by rubbing it into it’s skin. Andrew: And then by criss-crossing streaky bacon strips across it. The bacon will release it’s juices as it cooks and these will seep into the turkey meat. Dawn: Voila! 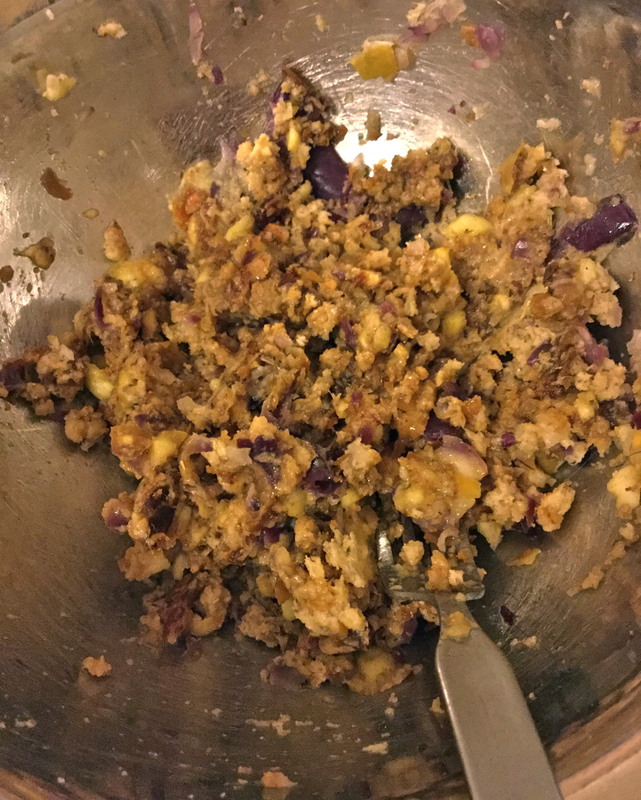 A simple stuffing recipe that can be made by everyone. A recipe that can be adapted to what you may have in the kitchen cupboards: from traditional sage and onion stuffing, through to chestnut and bacon stuffing, or apricots, cranberries and walnuts stuffing…the possibilities are endless. Whatever combination you opt for, enjoy your festive selection! Merry Christmas season, everyone! 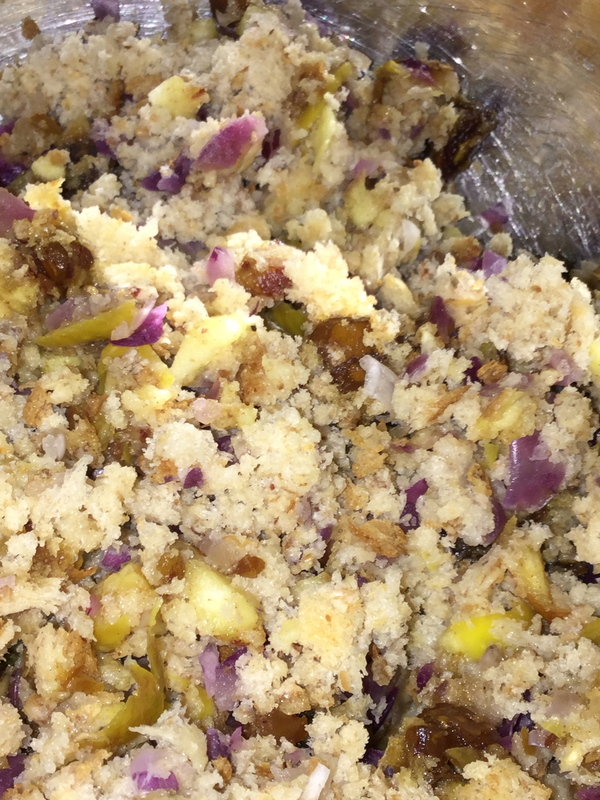 Posted on December 28, 2015 by Love Food UK	• This entry was posted in Christmas, Dinner, How to Make, Special Days, Winter Warming Food and tagged easy to make stuffing recipe, how to make stuffing, stuffing recipe, stuffing recipe for poultry. Bookmark the permalink.